Leaving Bangkok - about two weeks ago now. 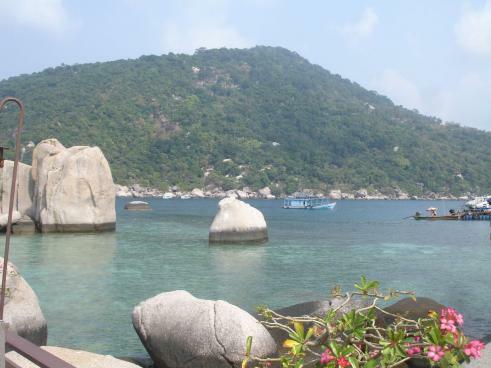 (i know i have everyone confused with datesand our whereabouts) we travelled to the islands just off Thailand - bus, boat, minivan - beech :) we went to Koh Tao first as it is the best place to dive in south East Aisa and we wanted to get some good dives in - i'll fill you in with that in a mo!! :) Basically as soon as we arrived we hit the beech to try and top up our tans before having to face the beech babes in Oz :) Koh Tao is the smallest island - but very very beautiful and the night life is great. One night Vic and I dared to venture the only Caberet in town - Classic night and i have to say , I am soooooooo jealous of those girls/men/them whatever - what amazing bodies!! What i wouldn't give :) Anyway - these guys showed us a great night and vic being vic got right into the spirit of things and got to dance the final dance with all the gang - in drag of course!! Pictures are so funny! !